Situated in Centro, this hostel is just a short stroll from the Plaza Bib-Rambla, the Palacio de Exposiciones y Congresos and Granada Cathedral. The Hostal Veracruz Granada offers a convenient 24-hour reception as well as wireless internet and parking. 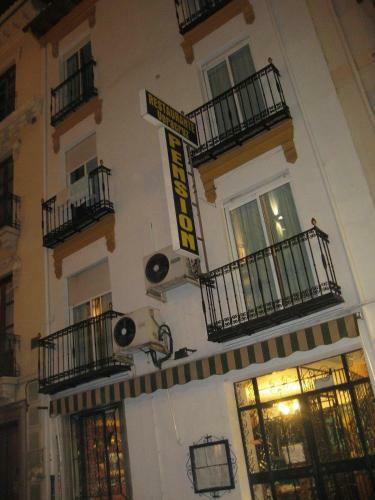 The Hostal Veracruz Granada provides air-conditioned rooms, great for travellers. A TV and a private bathroom can be found in each room of the hostel. The hostel is a 10-minute walk from the Madrasah of Granada, and an easy drive from Monachil. For those wishing to eat out, the hostel is close to a selection of local cafés and restaurants. This hotel is 1421 metres from the Alhambra entrance, 718 metres from Plaza Nueva (the absolute centre of Granada), 1815 metres from the train station and 3426 metres from the bus station.